How Can I Quit Smoking or Using Tobacco? 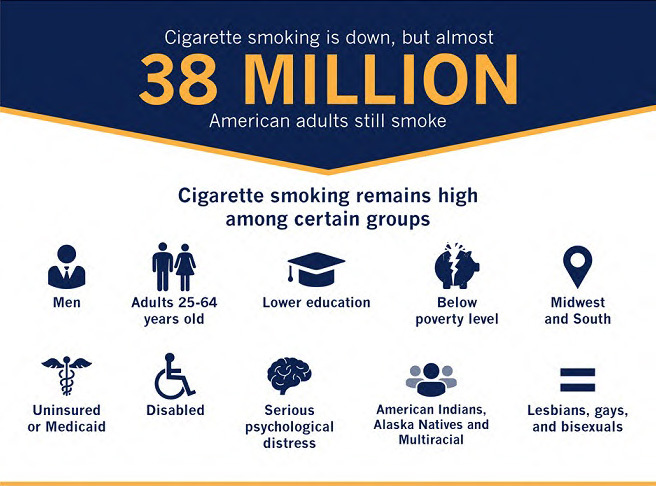 Did you know that 38 million Americans still smoke? Despite decades of warnings about the wide range of health problems associated with tobacco, smoking is still a problem. Smoking remains the largest preventable cause of death in the world, according to the American Cancer Society. And as family physicians, we understand the incredibly addictive nature of nicotine and tobacco and how hard it is to quit. Our goal is not to shame smokers but to help them quit, starting with an honest and open conversation with their family physician about tobacco use. With the end of year holidays approaching, now is a great time to think about quitting. If you want to quit, your family doctor can help. What Are the Dangers Associated with Smoking and Tobacco Use? According to ACS, life expectancy for smokers is more than 10 years shorter than for non-smokers. That statistic alone is a great reason to quit. The bottom line is that inhaling or chewing on harmful chemicals just isn’t good for us in any way. Smoking and other forms of tobacco use have a host of negative side effects. Here are just some of the key dangers, according to the Centers for Disease Control. Lung and other cancers: According to the CDC, smoking contributes to one in three cancer deaths in the U.S. and causes up to 90 percent of all lung cancers. It’s also tied to cancers of the mouth and digestive tract, kidney, liver, bladder, stomach and other organs, along with leukemia or blood cancer. Respiratory diseases: According to the CDC, smoking is directly linked to COPD (chronic obstructive pulmonary disease) an umbrella term covering two killers related to damage to the lungs and airways: chronic bronchitis and emphysema. Reproductive and pregnancy issues: Health issues for pregnant women and their babies including miscarriages, stillbirth, premature birth and low birth weight. It is also linked to fertility problems in both men and women. Other health risks: among the many other health risks associated with smoking are premature aging (takes a big toll on the skin and boosts wrinkles), gum disease and tooth loss. As the American Cancer Society puts it, there is no safe way to use tobacco. Because of nicotine and other chemicals found in both cigarettes and smokeless tobacco, quitting all tobacco use is the best way to stay healthy. And substituting one tobacco product for another is not a good way to quit. With smokeless tobacco, the risks lie mostly in digestive tract cancers including cancers of the mouth, esophagus and pancreas. Other health risks include mouth and tooth problems, heart disease and high blood pressure, heart disease and stroke and increased risk of stillbirth when used by pregnant women, according to ACS. That organization also underscores that smokeless tobacco products don’t help with smoking cessation and can simply bring another addiction into the mix. Instead, discuss the range of effective, FDA-approved treatments with your doctor. The current wisdom involves a two-pronged approach, taking on both the mental and physical aspects of tobacco addiction. This approach usually uses both medication and counseling, often coordinated by your family physician. Identify the reasons you want to quit smoking (including improved health and family concerns) and write down your reasons as a regular note-to-self reminder. Pick a Quit Day and make a plan to quit, including rallying support from family and friends and learning how to overcome cravings. Talk to your primary care doctor about medical options to help you quit. These can include Nicotine Replacement Therapy (in the form of gum, patches, sprays, inhalers or lozenges) and/or prescription drugs including Varenicline (which interferes with nicotine receptors in the brain and lessens withdrawal symptoms) and some antidepressants. Look into professional counseling to tackle the emotional side of tobacco addiction and other types of emotional support including support groups. Counseling and support groups are often in combination with medications. For smokeless tobacco users, American Cancer Society recommends developing a plan similar to a smoking cessation plan. However, as the American Cancer Society points out, there’s often an even stronger oral component with smokeless tobacco: users get hooked on having something in their mouths. For this reason, counseling and behavioral therapy can be especially helpful in quitting smokeless tobacco. How Can My Family Doctor Help Me Quit Smoking? Your primary care physician is a great place to start with your efforts to stop smoking or smokeless tobacco use. Your primary care doctor has the tools you need to get going and can connect you with the resources you’ll need along the way. He or she will talk with you about Nicotine Replacement Therapy (often the first step in a medical approach to quitting) and/or prescription medication. They can also refer you to a counselor with experience in smoking cessation and help you find local support groups. At Comprehensive Primary Care, the first word in our name reflects our approach to treating the whole patient. We know that stopping smoking is one huge step our patients can take to improve their overall health and prolong their lives. Many patients are uncomfortable talking about tobacco addiction with their doctors and feel judged by the medical community. But at CPC, we understand that our role is to help patients take those first steps to wellness by breaking through a challenging addiction. The commitment comes from our patients, but we have the tools to help–from day one and moving forward.